Description: EML to PST Converter tool has various features which provide the ability to export multiple EML items into exchange server immediately. This tool can export multiple EML items into Office 365 and also export multiple EML items into Outlook PST in very less time. Shoviv EML to PST Converter also facilitates to convert EML items into MSG in short span of time. This tool has User-friendly graphical interface which makes an easy operation to use for technical and even non-technical users too. It has Item filter option which allows to export only selected data during the process. 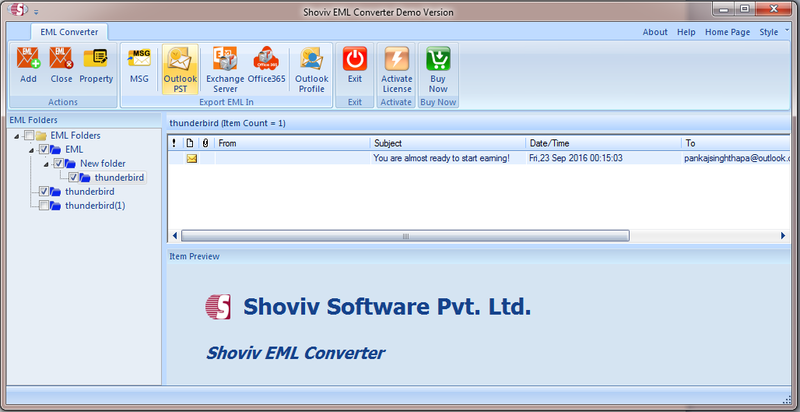 Shoviv EML to PST Converter tool permits the users to add multiple EML files without concern of the size limitation. One may also search EML items form exclusive directory location.